“The aggression against the former Brazilian leader is a continental movement directed by the intelligence services of the United States,” the National Assembly said. 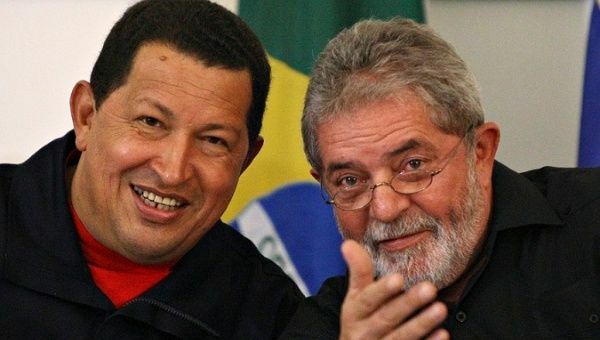 April 12 (teleSUR) Venezuela‘s National Constituent Assembly (ANC) has approved a resolution demonstrating solidarity with Brazil‘s former President Luiz Inacio Lula da Silvaand the Brazilian people. Constituent Assembly President Delcy Rodriguezsaid: “The aggression against the former Brazilian leader is a continental movement directed by the intelligence services of the United States to criminalize social movements against the expansion of the North American empire,” Prensa Latina reports. The ANC leaders agreed that Lula is being attacked judicially because he represents the progressive option in the Brazilian elections, and his imprisonment is designed to prevent him securing victory at the polls. During an ordinary session of the ANC, members decided to deliver the resolution to Lula in order to reiterate to Brazilians that Venezuela accompanies them in their struggle for defense of the Constitution and their right to self-determination. The Brazilian Workers’ Party founder was imprisoned this past weekend after Brazil’s Supreme Court denied his first habeas corpus plea to remain free while he exhausts his appeals. Lula was convicted last year on corruption charges in connection with the Operation Car Wash investigation, although he and his lawyers insist he is innocent.